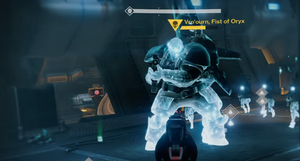 Vro'ourn, Fist of Oryx is a Taken Centurion that led an assault on The Bridge of Dantalion Exodus VI against the Guardian in the mission Outbound Signal. Vro'ourn is armed with an Arc Slug Rifle that fires much faster than its Cabal counterpart. On top of that, he can cover great distances with jump jets in his armor and can stomp the ground if faced up close. For longer-ranged attacks, he resorts to Axion Darts. These will bounce off walls in unpredictable directions and will track their targets, and will deal heavy Void damage upon a direct hit. Fighting him can be a very dangerous prospect as the room has very little cover, and Vro'ourn will aggressively corner the player at any given moment. Vro'ourn's helmet is also used as an Exotic helmet for the Hunter class.